This is the much anticipated Full Suspension 29er by Motobecane USA. Building upon over a decade of FS design, this 29er Full Suspension is equipped with 4 inches of terrain taming travel both front and rear. 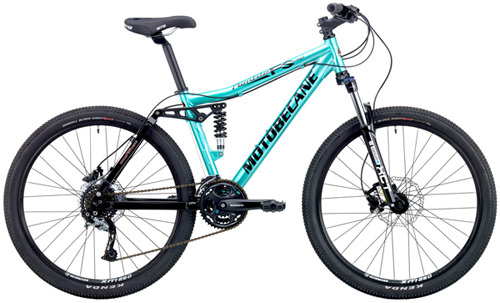 "…wondering if we were getting enough performance out of some of the other bikes to justify spending over twice as much..."
Even when reviewed at list price, magazines and experienced riders feel the Motobecane mountain bikes are incredible values. If you have ridden one you know why you want one. If you have ever wanted to try one, this is the best deal on a well equipped full suspension bike with powerful Shimano HYDRAULIC Disc Brakes and front lockout forks. Advanced Top Rated Four Bar Link Suspension + Lockout forks, Powerful Shimano Hydraulic Disc Brakes, smooth shifting FULL Shimano drivetrain. Motobecane's Full Suspension aluminum frame is so well-designed and engineered that some customers have said it will make most folks forget about Lindsay Lohan or any of Americas top models, past, present or future. Others have suggested it would be a survivor of anything Jeff Probst could ever think up. We say it's kind of like Angelina Jolie in Tomb Raider, beautiful and tough. 15in/38cm fits most 5'0" to 53"
16in/42cm fits most 5'3" to 5'7"